A man takes a sledgehammer to a Neo-Assyrian relief in a video released by ISIS on April 11, 2015. For a period of months last year, news of ISIS’ destruction of ancient cultural heritage sites in Iraq played widely in western media outlets. Between February 26 and April 11, 2015, the group released three videos showing men carrying out the destruction of ancient artifacts and architecture at the Mosul Museum, Hatra, and the Northwest Palace at Nimrud (ancient Kalhu). 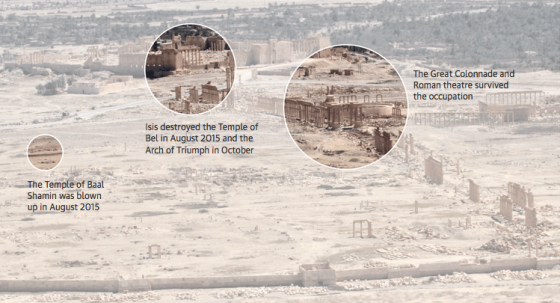 This campaign culminated over the summer with the drawn-out demolition of sites in the ancient city of Palmyra. The UNESCO World Heritage Site also served as a backdrop for the public executions of ISIS prisoners including the site’s lead archaeologist, Khaled al-Asaad. The videos ISIS has released to document and celebrate these exploits have revealed the role that art plays in contemporary discourses of identity and power. Samuel Hardy of the conflict antiquities blog calls these films “B-Movies,” and indeed it’s what they are: low-budget flicks reveling in wanton violence and destruction in order to attract a maximum return on viewership. While ISIS had been releasing videos for some time, it finally tapped in to a wider audience with its February 26 video showing the destruction of objects in the Mosul Museum’s Assyrian Collection and artifacts from Hatra and the Nergal Gate at Nineveh. Clips from the video played on the BBC, CNN, and on the website of The New York Times, among other news outlets. I encountered it first on Facebook, where the “Autoplay” feature subjected me to the start of the video before I even knew what I was looking at. Early in the video, the camera captures men unwrapping sculptures from their protective dust cloths. The video then cuts to shots lingering on the statue of a seated woman, a wall of plaques, and a case of artifacts. These shots recalled nothing more strongly than the shots of a slasher movie showing future murder victims in their final moments of ignorant happiness. These stagey shots, meant to heighten the tension of the video, instead called my attention to its constructed nature. While the video was presented as documentation of destruction, viewing it as an art historian I could also see that this film, like all media, was produced to manipulate its viewers. I had to wonder: what was it trying to achieve? 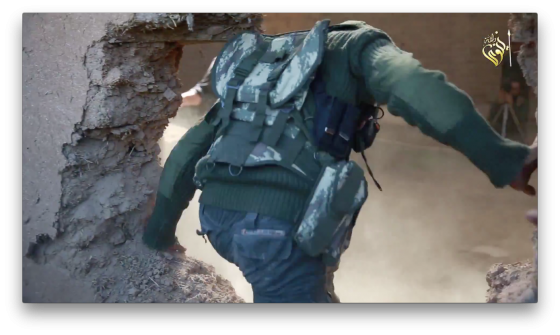 An action shot from ISIS’s April 11, 2015 video: men in military gear break through a wall. That August, when I asked the students in my freshman survey what they thought of when they considered the terms “art” and “history,” ISIS’ recent spate of destruction came up almost immediately. I began to think about how I might integrate a discussion of the recent events into my survey syllabus. Thinking back to my reaction to the Mosul video, I decided it was not enough to talk about what ISIS is doing; I wanted to address how they use visual media to accomplish their aims. ISIS has succeeded in using western news media to make their propaganda films part of our contemporary cultural landscape. But the art historical methods we teach in survey courses provide a means to undermine that agenda, to resist its manipulation through the exercise of critical viewing. I designed a lesson for my unit on the Ancient Near East that focused on one of the major sites of the Neo-Assyrian Empire and one of ISIS’ recent targets: the Northwest Palace at Nimrud, built by Ashurnasirpal II (r. 883–859 BCE). There are two parts to the lesson: first, a close reading of alabaster reliefs from the throne room of the Northwest Palace today in the British Museum; second, viewing and discussion of the video released by ISIS on April 11, 2015 advertising their destruction of the site. In the first part of the lesson, students work in small groups to interpret discrete panels of a relief cycle, then have the opportunity to teach one another about their panels. This close reading exercise provides the chance to exercise some fundamental art historical skills; it also makes the destruction of the site as documented in the ISIS video all the more real, even personal. In a 75-minute class, you can spend the first 45 minutes or so examining reliefs from the palace’s throne room. Plan to look at the relief of the sacred tree originally positioned behind the throne (slab B-23) and the imagery of warfare from the room’s south wall (slabs B-03a through B-11a). (See below for information on images.) These reliefs provide ample opportunities to discuss attributes, different approaches to representing space and narrative, and the role of figural decoration in architectural space. If you have less than 75 minutes for the lesson, skip the sacred tree relief and dive right in to the war. First, look together at the relief that was originally positioned behind the throne. The alabaster relief shows five figures arranged symmetrically around a sacred tree. Directly above the tree is a god, either Ashur (the national god) or Shamash (the god of sun and justice). The figures to either side represent Ashurnasirpal II, identifiable by his attributes of royal headgear and mace. Both of these figures will reappear in the narrative reliefs, so this gives students a chance to become familiar with their iconography. The figures on the outside of the composition are winged spirits wearing the horns of power also found on lamassu, the colossal winged lion and bull statues that flanked major entrances to the palace. They are asperging the king, possibly to convey, like the sacred tree, the fertility and prosperity of the empire under his rule. This relief provides a good opportunity to practice some formal analysis, discussing the impact of the symmetrical composition and the importance accorded to each figure within it. From the relief behind the throne, examine the narrative panels on the adjacent long wall. These panels show a few scenes of hunting (near the throne) and many of the violent campaigns that communicated Neo-Assyrian imperial ideology; our focus will be the martial scenes. These panels show Assyrians attacking and besieging cities, capturing and killing enemies, and at work in their own camp. Taken together, the panels are rather repetitive. It’s effective to break the students into groups, each studying one panel from the series. Use handouts to give each group a photograph and a line drawing of one panel. Ask them to study these images to determine 1) the identity of the figures; 2) the setting of the scene; 3) what is going on; and 4) what features the artist has included to allow a viewer to recognize these things. It may help to quickly do an example yourself; that will give you a chance to point out some further recurring attributes, such as the Assyrian soldiers’ pointed helmets. Let the students work on their panels for about 5 minutes, then bring the class back together. Prompt students to talk in turn about each of their panels, identifying subjects, setting, and action. Students will find their panels make much more sense in the context of the others, and they will start to contribute to helping their class members decipher each panel. The subject matter is gruesome, which makes it kind of fun. You may not have time to go through each panel in the same detail, but you can prompt students to point out unusual features of later panels (carrion birds eating corpses in the background, or a new type of siege machine). Take some time to discuss how the reliefs work as a whole. Do they show a narrative, or instantaneous events? How does the artist define space and mark the passage of time? Talk, too, about the audience for these reliefs. Installed on the wall leading up to Ashurnasirpal’s throne, they would have been seen not only by the king, but by any formal visitors. How these reliefs present Ashurnasirpal and the Assyrians? How does that presentation compare with other royal or national images you’ve encountered in class so far? Now that you’ve spent a good deal of time looking at Assyrian Nimrud, turn to the site as it is today. Plan to spend about 30 minutes on this part of the class, including the time it takes to watch the video. After you’ve shown the video, start discussion with a provocative question: “Is this art?” If you’re teaching a survey, you may have treated this question at the beginning of the course. Restating the question with this video as the subject will force students to further reevaluate their assumptions about art. As you discuss the video further, emphasize the choices made in the acting, filming, and editing of the work. As Hardy points out in his write-up of the video, the scene where the men break through a wall is filmed from the other side of the wall—a framing element meant to heighten the drama of the action, but which simultaneously reveals its gratuitousness. Ask the students how else they noticed the video constructing their gaze; what does it want its viewers to see? Who do they think is the audience for this video? For those who respond that it’s propaganda, not art, challenge them further by comparing the video to the representations of graphic violence they’ve just examined from the throne room at Nimrud. Is this art, or propaganda? How do we draw a line between the two? Students will also likely have a lot of questions about how to protect cultural heritage in unstable regions. They may want to know why outside museums or collectors can’t sweep in and “save” everything. This will give you a chance to discuss the ethics of dealing with looters and the antiquities black market. You can introduce or reinforce the importance of context for an archaeological understanding of an artifact. You should point out, moreover, that illicit trade in antiquities is one of the ways that ISIS supports itself, so buying artifacts on the black market doesn’t thwart ISIS, it supports it. This is also an opportunity to bring up the debate over ownership of cultural heritage. If your students seem energized by this topic, consider exploring it further when you cover Ancient Greece. 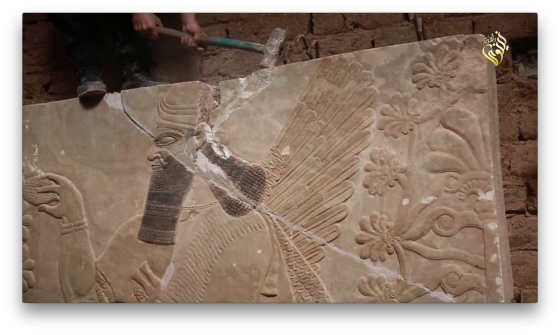 April 11 video of Nimrud destruction: originally published on YouTube, now removed. The Cuneiform Digital Library Initiative has an excellent site on the Northwest Palace, with plans, translations of inscriptions, and a list of where different parts of the palace have ended up. Here is their plan of the Throne Room (Room B). Nimrud: Materialities of Assyrian Knowledge Production is another excellent resource for teaching the site and emphasizes not only the archaeological context of excavated objects, but their modern context in museums. Description and stills of original video on conflict antiquities blog. Here is a shorter, heavily edited version of the video released by AP. This excellent article by Ömür Haramsah addresses ISIS’s videos as spectacle and their manipulation of western media. Ben Taub in the New Yorker on ISIS’s involvement in the antiquities trade. The author extends her thanks to Maggie Beeler, PhD Candidate in Classical and Near Eastern Archaeology at Bryn Mawr College, for sharing her insights and expertise on the Northwest Palace at Nimrud. Thanks also to Lynda Albertson, CEO of the Association for Research into Crimes against Art (ARCA), for sharing her archived file of the ISIS Nimrud video. Researchers and teachers can contact ARCA for further archived cultural heritage records. Maeve: Impressive and timely. You brought the agony and destruction right into the classroom. The only positive reaction to this mindlessness. Excellent!